It was a much more promising morning for Britain’s athletes on day two of the IAAF World Indoor Championships in Sopot on Saturday as a number made it through to the next stages of their events and both relay teams progressed. Beginning the defence of GB’s world 4x400m title, Eilidh Child, Shana Cox, Victoria Ohuruogu and her sister Christine clocked 52.36, 51.89, 52.74 and 53.61 respectively in the first heat for victory in 3:30.60 ahead of Russia with 3:30.87. With the second heat the quicker of the two all four teams progress – winners USA with a world-leading 3:29.06 ahead of Jamaica with a national indoor record 3:29.43, Poland and Nigeria. There was confusion in the second men’s 4x400m relay heat as athletes were called back to the start having already run almost half way around the track. But maintaining his composure, Britain’s Conrad Williams ran a strong first leg to set up the team for victory. Clocking 46.53, he handed to Michael Bingham, who ran 46.90, then it was the turn of Jamie Bowie with 46.49 and Luke Lennon Ford with 46.14 to clock 3:06.09 ahead of Russia’s 3:06.63. Behind them Nigeria ran an area indoor record 3:07.95 but that wasn’t enough to see them through as fastest losers as Olympic champions Bahamas also missed out. USA won the first heat in 3:04.36 ahead of Jamaica with 3:06.12. Poland and Ukraine clocked 3:06.50 and 3:07.54 in that heat to claim the last two places in the final. All of the main protagonists made it through to the next stage of the women’s 60m, including Olympic and world sprint champion Shelly-Ann Fraser-Pryce, winning heat two in 7.12 and Murielle Ahouré, who is unbeaten over 60m since finishing second to Veronica Campbell-Brown in Istanbul in 2012, winning the final heat in 7.09. 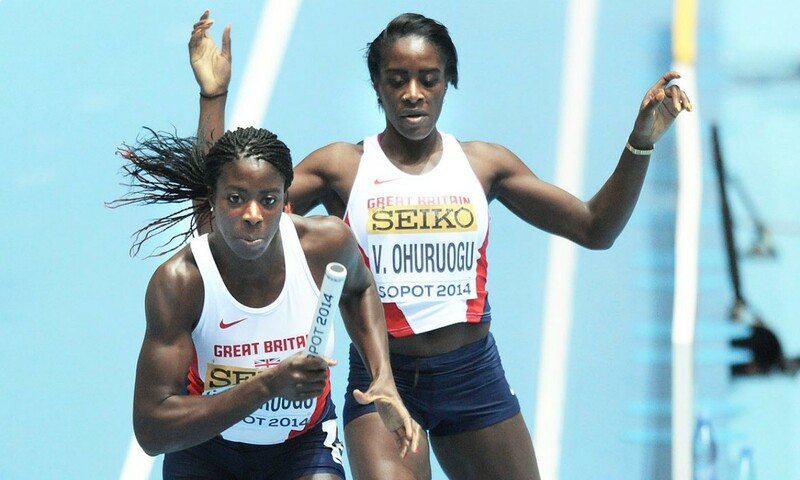 Behind Ahouré, Britain’s 19-year-old European junior 100m silver medallist Sophie Papps equalled her personal best of 7.22 on what is her senior GB debut to also advance to Sunday’s semi-finals along with her team-mate, UK indoor champion Asha Philip, who won the first heat in 7.18. In the fourth heat, Jamaica’s Campbell-Brown, making an immediate return to competition after the CAS overturned her two-year suspension last week, ran 7.22 in a race won by world indoor bronze medallist Tianna Bartoletta of the US in 7.13. Continuing his run of personal bests in 2014, UK indoor 60m hurdles champion William Sharman clocked 7.59 to win his heat and cruise through to the next round. “It feels really good,” he said after the race, “four competitions and four PBs, can’t ask for more than that.” Andrew Pozzi, the man Sharman shares the UK indoor title with, also won his heat, equalling the 7.56 PB he set in Istanbul two years ago before his injury problems. Frenchman Garfield Darien was awarded the same time as Pozzi in that fourth and final heat, to also match the time of his compatriot, the world indoor bronze medallist Pascal Martinot-Lagarde, from the first heat. Two athletes made the automatic qualifying mark of 6.70m in the women’s long jump – Serbia’s world bronze medallist Ivana Španović (6.77m) and Russia’s two-time European indoor champion Darya Klishina. Britain’s world indoor bronze medallist Shara Proctor was just one centimetre off that automatic qualifying mark and will be joined in the final by team-mate Katarina Johnson-Thompson, who managed a best of 6.60m to also advance. In the high jump Olympic bronze medallist Robbie Grabarz and British team-mate Tom Parsons couldn’t share their success as they both failed to clear 2.28m and make the final. Ukraine’s Andriy Protsenko and Russia’s Daniil Tsyplakov led qualifying with clear runs up to 2.28m, while Mutaz Essa Barshim, Erik Kynard and Ivan Ukhov will also feature. World decathlon record-holder Ashton Eaton picked up from where he left off in the heptathlon, clocking 7.64 in the 60m hurdles for a championship best, bettering the 7.68 mark set by himself in Istanbul two years ago to go nine points ahead of his five-event tally when setting his world record in 2012. He maintained that nine-point lead on his world-record mark following the morning’s final event, the pole vault, too, as he matched the height he cleared in 2012 – 5.20m – meaning he will need to run at least 2:33.54 in the 1000m to break the his heptathlon world record. His personal best is 2:32.67. Other multi-event action saw Netherland’s European indoor heptathlon champion Eelco Sintnicolaas win the pole vault competition with 5.40m. That moved him to fourth overall with 5313 points with one event to go, behind 2011 European indoor champion Andrei Krauchanka of Belarus with 5450 points and Belgium’s Thomas van der Plaetsen with 5391 points. One throw was all it took for New Zealand’s two-time Olympic champion Valerie Adams to book her place in the shot put final as well as assert her dominance once again. Returning from ankle surgery, she threw a world-leading 20.11m for the second best-ever throw at this stage of the world indoors. Behind her, Germany’s European indoor champion Christina Schwanitz, who took world outdoor silver behind Adams in Moscow last summer, threw 19.73m on her second go as the top four, also including Yulia Leantsiuk of Belarus and Michelle Carter of the US, made the automatic qualifying distance of 18.70m. World and Olympic bronze medallist Lijiao Gong also progresses. Only one athlete managed the automatic qualifying mark of 16.90m in the men’s triple jump – Romania’s 2004 Olympic silver medallist Marian Oprea with 17.02m. Cuba’s world silver medallist Pedro Pablo Pichardo qualified with the second furthest leap of 16.82m. Russia’s Lyukman Adams and Cuba’s Ernesto Reve were also among those to make the final.